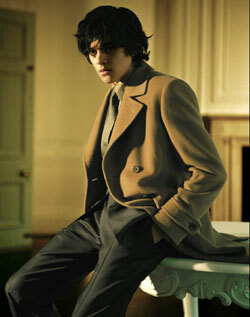 I can’t say I’m a big Jaeger shopper, but their new menswear range – under the name Jaeger London – might be worth a look. It’s their attempt at pitching at a younger audience, but rather than going for a bad "mod" range, they claim their range is more inspired by the cut and style of the sixties – – think camel trench coats, polo necks and mohair suits. From what I’ve seen, it’s worth a look, but with prices a bit on the high side. The picture featured here includes a camel hair car coat (£599), suit (£499), Jaquard shirt (£70) and a silk dogtooth tie (£50). The range is much more extensive than this and its probably worth a trip to your nearest store to check out the details/quality. And if you like what you see, might be some rich pickings come sale time. There’s also a women’s range featured on the website, but so far, I’ve not been able to find out enough about that – more when I do.